In perhaps their best performance to date under Pep, Manchester City looked excellent against an albeit weak West Ham United. From the first minute, they controlled the game with a strong display in possession matched by intelligent pressing both in and out of transitional moments. 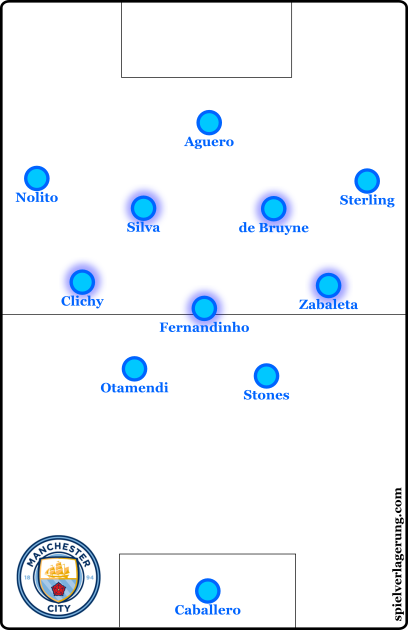 Once again, they lined up in a 4-3-3 formation with Fernandinho taking on the lone pivot behind de Bruyne and Silva. Aleksandr Kolarov was absent from the starting lineup as Otamendi sided John Stones in the centre-back pairing. Slaven Bilic sprung a tactical surprise of his own as West Ham operated in a 5-4-1 formation as they looked to concede possession and sit deep in a defensive-minded approach to the game. The tactical highlight of the game was City’s football when in possession. Particularly in the first half, they opened up their opponents on a consistent and frequent basis. Silva and de Bruyne constantly threatened in pockets of space between the lines, whilst Sterling was a particular danger down the right wing, where he benefited significantly from more isolation situations in a performance which saw him net twice and receive the man of the match award. City’s dynamic back three made for a strong build-up. They took a progressive and rather aggressive approach to their build-up play. Both Stones and Otamendi were free to move forwards (whilst the other would cover) and Fernandinho showed his footballing-intelligence in his balancing movements between the two of them. The advancing of the centre-back only added to the overloads in midfield and with Fletcher rather outnumbered, they could progress the ball with ease for significant periods of the game. Because of this, City were able to maintain a strong tempo and rhythm to their ball-circulation, applying a constant wave of pressure on West Ham’s midfield. The dynamic nature of City’s back 2-1 resulted in a flexible shape which saw many permutations as City were bring the ball out of defence. Rotations of positions were executed well, with Fernandinho timing his complementary movements to best aid the actions of Stones and Otamendi. Such as in the example to the left, they were able to use this flexibility and dynamic to open spaces for eachother in the first line, giving the ball-carrier a better opportunity to penetrate the midfield which they did so frequently throughout the first half. It was a small 1-2 with situational-midfielder John Stones which gave the space for David Silva to begin his run through the West Ham midfielder in the build-up to Sterling’s opener. Although much has been said of City’s ‘false full-backs’ around the beginning of the season, both Clichy and Zabaleta acted in a more ‘orthodox’ manner against West Ham. They acted largely in their respective half-spaces and although both showed a capacity to come inside when the situation deemed necessary, it was much less extreme in comparison to previous matches. They did, however, maintain quite a deep position whilst their wingers were occupying the touchlines and stretching West Ham’s defence. 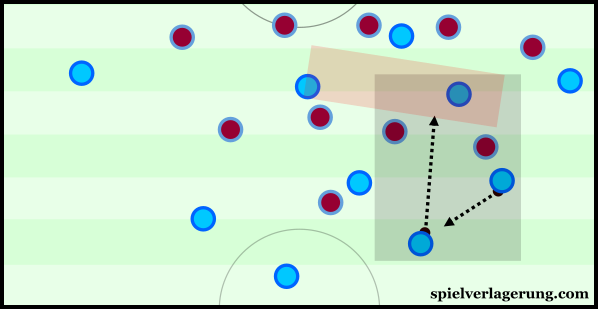 The inside movement of the full-backs was often used to creater better isolation moments. When they did move inside, it was generally in order to create isolation situations for the wingers. 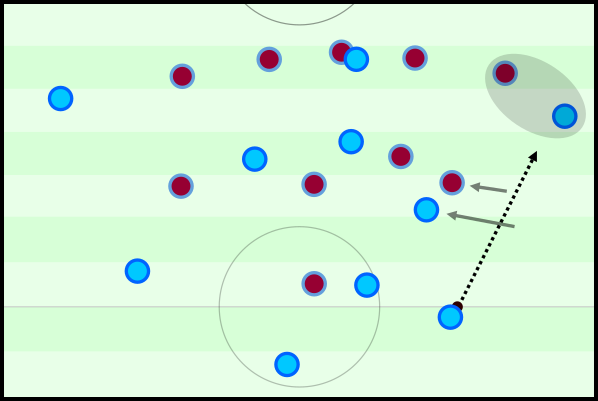 By moving towards the centre of the pitch, they attracted the West Ham winger to follow suit which opened up the diagonal passing lane to the ball-near winger. It also dragged the winger away from his full-back, meaning that he would have less protection when faced with the trickery of Nolito or Sterling, the latter especially. The ‘rejuvenation’ of Raheem Sterling is in a significant way a result of the better football which City are playing. The ability of a winger is largely dependent on the situations which his team creates for him. If the ball circulation is slow and lacks dynamism, then the winger is likely to receive the ball in situations where the defensive is already settled and his opponent is receiving good support from his teammates. With City now playing a faster brand of football, Sterling is receiving the ball more quickly and in situations where the defensive is still shifting to his side. Against a less stable defensive line, Sterling can threaten more with his dribbles and his performances so far into the season reflect this clearly. With an aggressive and direct possession game, Pep’s team were able to exert a clear level of control for the majority of the 90 minutes. Their spacing in what was a rough 2-3-4-1 structure gave them a strong occupation of the spaces across the pitch, with the ‘3’ and central pairing of the ‘4’ (highlighted) able to control the space as well as the ball through an intelligent positional game. The structure of the team had 4/5 vertical and many horizontal lines of players, resulting in an excellent level of natural staggering in the shape. By having players staggered across the structure, City increase their capacity to find gaps within the opponent’s block, due to the varying ‘heights’ of the players. For example, if the ball is down the left of the shape, then City have Otamendi, Clichy, Silva, Nolito and then potentially both Fernandinho and Aguero all on different lines. Because of West Ham’s defensive shape of just 3 lines, they are immediately at a disadvantage because it becomes difficult to cover the players occupying different lines simultaneously. Aside from the positional superiority which they established, the spacing of the team had some other benefits. 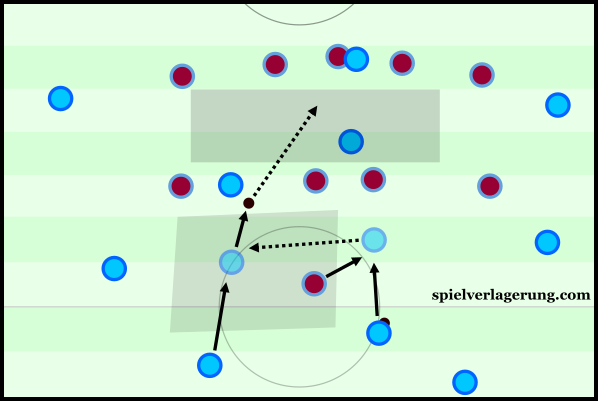 Firstly, the level of diagonal connections between the players supported their ball circulation significantly. Not only did it support the dynamics of the interplay with more diagonal passing being possible, but it allowed for triangles to more naturally develop, helping them combine with speed and fluidity. Important to their control of the game was their reaction to losing the ball. Their counterpressing had a great intensity in regaining control over the possession, with Fernandinho being particularly effective in anticipating the loose balls. The deeper positioning of the full-backs made for an important presence in counterpressing between the half-spaces and the trio were able to stop many counter-attacks from formulating. Not only could they advance to apply pressure on any loose clearances from the opposition, but they could help deter any opportunities where the Hammers were able to get to the ball first, providing a greater security in the middle of the pitch. City’s deeper structure aided their ability to counterpress after losing the ball. Through an effective counterpress, City were able to sustain the heavy pressure on West Ham’s defence which was set from the beginning of the game. They stopped the visitors from establishing any real attacks and Bilic’s team spent long spells stuck within their own half. They controlled the spaces in front of West Ham’s midfield and were in good positions to intercept and free balls if an attack broke down. As I detailed in my preview to Pep’s reign at City, a strong positional structure in possession is key for the moments after turnovers. Good distances when in possession of the ball translates directly to having strong connections in the often unstable moments following a break down. By having a good structure, a team is able to press relevant and many areas of the pitch, whilst having an important capacity to support teammates through the links they formed in the previous spell on the ball. In an attempt to dull a City attack with a much depleted squad, Slaven Bilic took to a 5-man defensive line away at the Etihad. Recent England-call-up Michail Antonio and Arthur Masuaku acted as wing-backs on the right and left respectively, whilst the three centre-backs consisted of Ogbonna, Reid and Collins. In this shape, the visitors took on a mid-low defensive block, resting their hopes on City being unable to break through the proverbial bus. The back-5 was likely chosen as a way to give more security in the defensive line against the best striker in the league. The additional centre-back would hypothetically also offer greater support to the full-backs, though we didn’t necessarily see this as Sterling and Nolito both prospered. Although a fine plan in theory, their execution of the defensive strategy left much to be desired. The Hammers’ biggest flaw was their passivity in the midfield. The visitor’s often struggled to create and then maintain defensive access to the City ball-carrier, with their midfield in particular unable to enforce sufficient pressure. Obviously they weren’t intending to press high up into City’s build-up, but the midfield pressure, generally done for stability and to stop the man in possession from having the opportunity to find his next pass, was lacking. Aside from their inability to effectively press the opposition’s possession, West Ham were also noticeably uncompact. Despite having a fairly tight midfield four, they frequently let up gaps between the lines of midfield and defence, which Silva and de Bruyne were happy to take advantage of. The extra centre-back came at the expense of an extra man in midfield and Bilic’s side were somewhat susceptible to overloads behind Kouyate and Noble. City’s staggering was able to create free men in gaps within the West Ham block, which wasn’t compact enough to deal with their fast interplay through the midfield. Against most sides in the league, their defensive performance would’ve likely been sufficient and the East London team won’t face another opposition with as strong of a possession game this year. 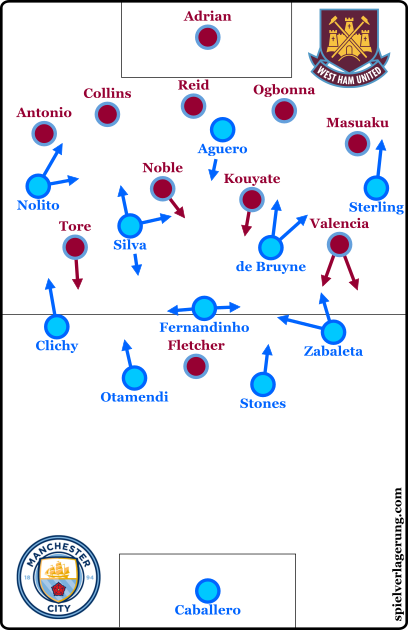 West Ham were noticeably uncompact, and City’s midfielders occupied the gaps well. The issues of their uncompact defending were evident in the opener. Once Silva had managed to shake away the backwards-pressing of Valencia, he was completely free between the lines of midfield and defence. From this position, he had comfortably enough time and space to execute the through-ball to Nolito who dragged it back for Sterling to finish. Whilst West Ham were distinctly poor for large periods, City’s performance shouldn’t be completely overlooked. Their extremely depleted squad rarely looked up to the challenge of Pep’s City, yet their weak showing was in some way down to the strong play of the home side. Through exerting such a level of control, City stopped their opposition from developing any rhythm in their attacks and they failed to have a meaningful share of possession during considerable periods. After the interval, City weren’t as in-control as they had been throughout the first 45 minutes. They were unable to progress the ball centrally as often as in the first half, with a slightly weaker positional structure to do so. The Silva – de Bruyne pairing wasn’t as connected to their deeper teammates in a number of possessions and instead, City had to look towards the wings instead. Their weaker build-up became problematic at times, making slower ball circulation which invited pressure and saw some misplaced passes being made. Bilic immediately looked to secure the right side of his team, bringing Sam Byram in place of Tore and the ex-Leeds full-back moved to the right of the defensive line whilst Antonio moved into the midfield. Although they were still uncompact for periods of the second half, their midfield pressure improved somewhat and they were able to win the ball more in the midfield third. Especially after their first goal, they tried to press higher in City’s build-up and did so to some effectiveness. The co-ordination of their pressing wasn’t excellent, but it served to disrupt and challenge the home side’s construction. From an attacking perspective, they were able to make some cause for concern in their direct game and crossing. With City exerting less control, the visitors had more clear opportunities to form established attacks and when they did so, they looked towards the flank where they would deliver crosses into the tall Fletcher. The tall striker received better support from his wide-men in comparison to the first half, and the distances between him and the midfield were much more manageable. Their better play in possession allowed them to find him more accurately as City’s pressing declined somewhat, and during the period of the rhythm shift, were able to cause much more threat than they had done in the first 45. Naturally, the final 20 minutes saw a more open game as West Ham looked to find their second goal and their equaliser. A more chaotic match with more moments of transition, City were able to create a number of dangerous situations attacking after a turnover from the opponents. Although they had the ball on numerous occasions in front of the Hammers’ defence, they were unable to convert a series of chances to make a slightly nervous end to the match. These nerves were eventually quelled however after an intelligent piece of creativity in the box by Sterling made the scoreline 3-1 in the 1st minute of injury time. Man City made an outstanding performance in the first half and showed many promising signs of what’s to come under Guardiola’s tenure. They repeatedly opened up the 10 space behind West Ham’s midfield with Silva and Sterling in particular having excellent matches. Although West Ham failed to put up a great challenge, it doesn’t completely take away from the performance of the home team. However, the anticipation surrounding their derby on the 10th of September is even greater now as both teams will look to maintain their 100% record under new managers. Fantastic work!you help us to understand the beautiful game!! Fantastic article, as usual TP! Really owe this website a lot as due to learning more about tactical theory etc I’m really getting to see games from a different perspective. Do you think that as the season progresses we see more variable movements from the full backs and wingers, like how Lahm and Robben would sometimes interact for Bayern? I doubt we will see it for some time as stability is more important for the team right now as it is still experiencing growing pains. What don you think the reason behind the FB’s not coming inside more in this game then the other games? Who would you favour in this upcoming match? United or City? I’d like to know this too. I can’t call it either way.